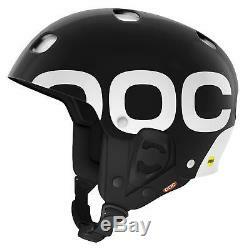 POC Receptor Backcountry MIPS Snow Ski Bike Helmet Uranium Black Small. POC Receptor Backcountry MIPS Snow Ski Bike Helmet Uranium Black The Receptor Backcountry MIPS is based on the Receptor + shell and core, and has double shells, a multi-impact EPP liner and an Aramid Penetration Barrier. The award-winning helmet is equipped with the patented MIPS system to reduce the rotational forces to the brain in the case of an oblique impact. The double overlapping shell and POCs patented VDSAP allows for a fully ventilated helmet with maximum comfort, without sacrificing penetration resistance. TECHNICAL FEATURES MIPS (Multi-Directional Impact Protection System) Ventilated Double Shell Anti-Penetration System (VDSAP) Aramid Penetration Barrier (APB) Multi-impact EPP liner PC/PTFE inner shell Neckroll with integrated Recco avalanche rescue system Color finish: shiny Weight 550 g CERTIFICATIONS EN 1077-B, EN 1078, ASTM 2040 MIPS (MULTI-IMPACT PROTECTION SYSTEM) MIPS is a system used to reduce the rotational force to the brain in case of oblique impacts. Accident statistics show that the most common accident occurs in an oblique impact to the head, resulting in a rotation of the head and brain. The brain is more sensitive to oblique impacts than radial impacts. In a helmet equipped with MIPS technology, a low friction layer separates the shell and the inside of the helmet. When subjected to an oblique impact, the low friction layer allows a small controlled rotation of the shell relative to the lining. MULTI-IMPACT PERFORMANCE Most helmets today have liners made of EPS (Expanded Polystyrene), a great shock absorbing material, but it will be permanently compressed when absorbing an impact, even a minor one. Using multi-impact EPP (Expanded Polypropylene) as core material creates a helmet that will protect your head over and over again. VDSAP (VENTILATED DOUBLE SHELL ANTI-PENETRATION) POCs patented VDSAP system (Ventilated Double Shell Anti-Penetration) is made up of two ventilated shells that are placed offset for maximum protection against penetration from sharp objects, while maintaining good air flow and ventilation. The safety performance of this construction is amazing and represents a unique take on helmet design. SUPER VENTILATED HELMETS By studying the air flow inside the helmets, POC has been able to create super ventilated helmets with adjustable air flow to adapt it to the conditions. The combination of goggle vents, chimney vents, VDSAP and adjustable vents makes the helmets very ventilated, with a maintained low weight and a high level protection. Please select your size above when completing checkout See Size Guide below (PLEASE NOTE THIS IS AN ESTIMATED SIZE GUIDE ONLY): S - 53 - 54cm M - 55cm - 56cm L - 57cm - 58cm XL - 59cm - 60cm For most accurate head measurement, measure circumference of head with tape measure or piece of string (then measure the string with a tape measure or ruler) just above eyebrows to back of head. Please note: We do not accept cheques, postal orders, bankers drafts or bank transfers. We want you to have your order ASAP. We also deliver to the majority of Europe and Worldwide destinations. All products advertised are held in stock at our warehouse and are ready to be dispatched. The item "POC Receptor Backcountry MIPS Snow Ski Bike Helmet Uranium Black Small" is in sale since Monday, March 12, 2018. This item is in the category "Sporting Goods\Skiing & Snowboarding\Ski & Snowboard Helmets". The seller is "fostertrading" and is located in Wimborne, Dorset, United Kingdom. This item can be shipped to all countries in Europe, all countries in continental Asia, United States, Canada, Australia.